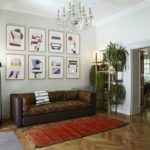 We love being involved with anything to do with 19 Greek Street, the ambitious townhouse gallery and interior design studio of Marc Péridis. At last month’s London Design Festival we loaned the Soho venture a series of our rugs for their show Art of Progress. The exhibition brought together ethical furniture and products for the home from pioneering designers who have made environmental living a priority in their work. It also put a spotlight on the idea of restoring, upcycling and using more of what we already have in the world. And this is where our vintage rugs come in. 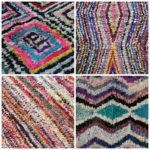 They are being loved and used again 50-60 years after they were made – and they were also made by tribeswomen who worked with natural dyes. …To the volunteer-run Tiny Miracles, which aims to bring 700 people in Mumbai out of poverty by teaching skills such as welding and stitching to uneducated people so that they can generate an income. Everything included was presented in beautiful scenes as full of inspiration for colour-combining as they were for ideas for living in a more positive and environmental way. Moody denim blues graduated to lighter pastel blues, juxtaposed with pinks – from mink to pale blush – and our softening, textured rugs. Here, we present some of our favourite moments of the exhibition. Pink was used exactly the way we love it – grown up and sophisticated and not at all sickly – and we love that the ceilings were painted to match the blue walls instead of straightforward white. A little added decoration from our Beni Ouarain still keeps the focus on the other colours in the room, but adds a bit of a graphic twist. Now, a very pastel corner that featured a delicious green in the mix with blue, pink and coral. 19 Greek Street is being run as more of a pop up space now, with some plans underway for greater online activity. You can sign up to their newsletter (at the bottom of the homepage) to be kept up to date. And if you like the look of the rugs featured here, don’t forget to check our etsy site or make an appointment to visit us.